Not that mirrorless users are any worse than DSLR users, but I keep running into a few things that most mirrorless users are simply not doing, but they should be. Save your settings to a card — Most of the recent mid-to-high end mirrorless cameras have this function, but you're not using it! Yet many of you (and I) complain about how difficult it is to find and set up all the possibilities on your camera. You don't want to ever have to do that multiple times if you can avoid it! So do yourself a favor. Get your camera set up basically the way you want it to be when you turn it on each time you go out shooting. All the button customizations, the basic image quality settings, you name it. Now take a small capacity older card you have laying around, mark it with the word SETTINGS, and save your settings to it. Take the card out of the camera, put it in your card wallet and...the day you've completely messed up your settings and want to return to square one, just get out that card and restore your base settings. Seriously, this little thing you haven't been doing will save you a lot of time down the road. Related to settings—plus the fact that some cameras have hundreds of things you can set with an untold millions of combinations and permutations—is that I find quite a few mirrorless camera users simply don't study their camera and learn what it can and can't do. One thing I've noticed recently is that the "go to" method of continuous focusing for many mirrorless users is to put the camera in some form of 3D/Face/Eye tracking, put the initial focus cursor (if there is one) on the subject, start the focus system (half-press of shutter release or AF-ON button), and then reframe their composition. Basically, if the camera identifies and seems to follow the subject decently, they assume they can then just ignore focus and concentrate on framing. This technique works reasonably well for some types of shooting, and I'll use it at times with certain cameras, but it tends to not be perfect. The casual users like it because it achieves better focus than they've gotten from previous cameras (compacts, SLRs, DSLRs, etc. ); but beware: "better" is not "optimal." Change your settings to what is optimal for a situation— To do this, of course, means you must also Learn Your Camera's Details and Nuances. 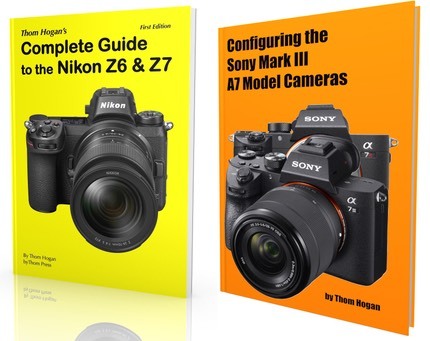 There's a reason it takes me over 1000 pages in my Z6 and Z7 book to completely describe all the features and performance, plus when you might want to change a setting: modern cameras are complex. Perhaps too complex (story for another day). Nevertheless, the more you learn about what you camera can and can't do, how to make it do it's best under your control, what it might not do optimally and need help with, and so on, the further you can take your picture-taking. What I find is this: too many mirrorless users are counting on the what-you-see-is-what-you-get EVF—which remember, is basically a small uncalibrated XVGA screen—to inform them of everything they need to know. Appears to be in focus (with those handful of pixels). Looks like the right white balance (on the uncalibrated screen). Seems like the right exposure (and the JPEG histogram wouldn't lie to me, right? ;~). Trust, but verify. And control everything. To do that, you'll need to learn more about your camera than just using it at a bunch of default and automatic settings. The number one thing I see mirrorless users not doing is turning IS off. Instead, they get reliant upon the crutch of the camera having to deal with casual and poor handling on the user's part. I've heard some really convoluted logic from users on this. "I'm getting older and can't hand-hold consistently at 1/60 any more, but IS lets me shoot at 1/15 all the time and then I don't have to worry about trying to hold the camera steady." Then I ask to see an image at pixel level. Motion! But it's not just that. In lens IS has a tendency to make bokeh rough, and even on-sensor IS can impart bokeh changes, particularly if you're using silent shutter. IS doesn't tend to do a good job of removing shutter slap (use electronic first curtain shutter instead). IS has a top frequency of correction. What happens when the vibration/motion is above that frequency? Sports shooters asked for IS on long telephoto lenses from the SLR/DSLR makers, then started turning it off when they discovered that at 1/2000 of a second shutter speeds their edges weren't as crisp as the lens could deliver. Don't get me wrong. IS is a great feature. But just leaving it on all the time is not the image optimization technique you think it is. The proper thing is to leave it Off unless needed (e.g. you know it will improve your results), and to not handle your camera more sloppily just because you think an automatic system will fully compensate. Update: I've seen the comments on several forums about this point. I'll stand by what I wrote, though I'll add one comment: where I draw the line on this tends to be a little different from brand to brand. The Olympus IS systems are the best of the breed, IMHO. They resist producing the acuity loss I'm trying to avoid on moving subjects and inactive platforms better than the rest. I would guess that if we were to look closely, we'd find higher specified parts and frequencies being used in the Olympus system. Sony sits a bit behind Olympus in this respect. Nikon's Z IS is at the other end of the spectrum (that's not to say their IS doesn't work, it's just not the most effective one). I know this is a controversial subject. I've even seen people try to "prove" I'm wrong, but the problem is that they then use static test charts as their subject. If your subject is static and the camera moving (e.g. handheld), that's actually when IS tends to do its best job. Since that is actually how most people are photographing most things, they get deceived into thinking IS should always be on. You need to develop your own standards on this, but you also need to be aware that IS isn't an "always on" option. Indeed, if it were, the camera makers wouldn't let you turn it off! Subject motion is where you look to set your standard. Maybe you think IS is fine with a slow subject, like a person swaying or moving slowly. But there will be some level of motion speed where you're better off turning IS off unless you're shooting from an active platform. Personally, I have a difficult time keeping track of this in the m4/3 world. Too many moving parts. In much of the mirrorless world, a bunch of lens updates would mean that you have to keep mounting each new lens that needs an update on the camera in succession, repeating a not-so-great process over and over. Which is probably why you don't do it. Yet you should. Because a lot of those lens updates fix or improve camera/lens communication when focusing. For years I've been arguing with Olympus users about the next thing they don't do: clean the image sensor. Why Olympus? Because of the small sensor and diffraction limits, no one tends to shoot above f/5.6. Plus Olympus chose a very thick filter glass so as to put any dust or other surface problem in a position where its primary impact is more of a contrast lowering, not an observable spot. So what happens is that Olympus users don't "see" a problem, thus there "isn't" a problem. That, of course, is wrong. Update: this article was no different. Bang came the "Olympus sensors never need cleaning" comebacks. That usually comes based upon subjective anecdotal experience in looking at their own images. The last two times I was physically present with an Olympus user who claimed this, we did two things: took a scope to the sensor filter (oh, dust! ), and then wet cleaned it (oh, swab picked up stuff!). Again, from a photographic standpoint, you generally don't see a direct dust spot on Olympus gear due to the thick filtration over the sensor. Any small dust, pollen, or other thing that continues to cling to filter front just tends to create an extremely small contrast reduction over a group of pixels. Most people are perfectly happy with that, apparently. Olympus users seem to think I'm saying that the Olympus shake-it-off system isn't very good. That's not true at all. The built-in sensor cleaning Olympus has is among the most effective I've seen. But it's not perfect. Clean you Image Sensor periodically — This is a tricky one, as Olympus very clearly said that you shouldn't use sensor-touching techniques for this yourself, and other companies have warnings about not doing the same thing in their manuals. So, first make sure that your camera's shake-it-off function is turned on and done automatically (preferably at shutdown, as doing it at startup means it takes a few more moments before the camera is ready to shoot when you turn the camera On). Second, keep the camera's mount pointed down when changing lenses, and don't change lenses in dusty or misty environments if you can avoid it. Next, do periodic visual inspections in a clean environment. Have a known clean blower bulb handy when you do, and use it to blow anything off that the shake-it function didn't get. Keep your lens mount clean, and the back area of your lens clean. What happens after that? Well, given the camera companies are trying to keep you from touching the filter over the sensor directly—mostly because they fear you'll damage the IBIS system—the simple *cough* solution is to send your camera in for sensor cleaning once a year. My experience with that is mixed. Sometimes I get an immaculate sensor back, sometimes it looks like an untrained monkey did the work. Still, unless you're a risk taker, it's really your only viable option. Okay, so there you have a bunch of things to start doing. Or write me an email arguing that you don't need to do them ;~). Good luck with either approach.